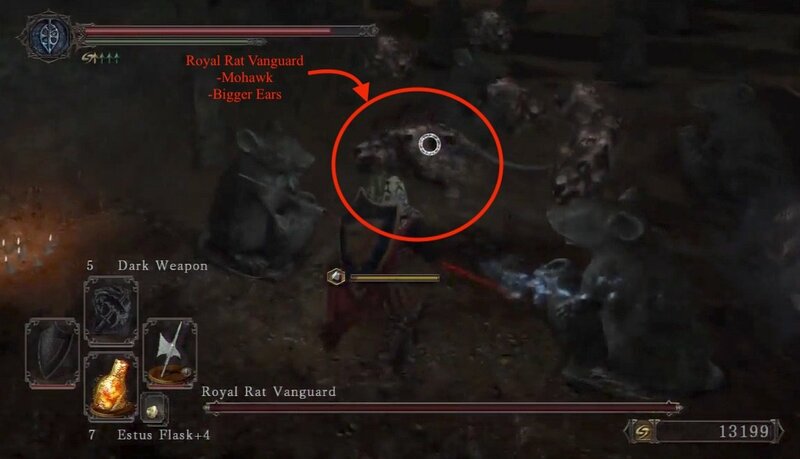 If the player has already joined the Rat King Covenant via the Rat King in the Doors of Pharros, after defeating the Royal Rat Authority boss, then no enemies will be hostile towards the player in this zone. 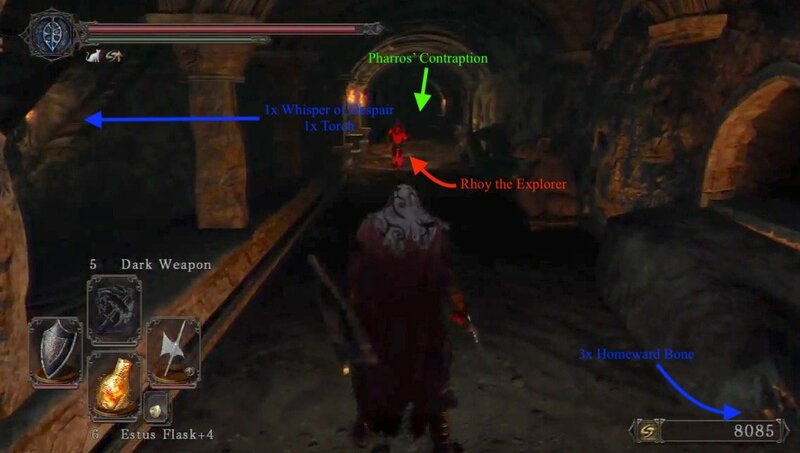 Nor will the Dark Spirit Rhoy the Explorer invade the player. Using a Bonfire Ascetic on the first bonfire here (Harvel's Resting Place) will respawn the Dark Spirit Rhoy the Explorer. Doing this makes Rhoy a useful target to farm Awestones. After coming into the area from The Pit in Majula, the first bonfire, Harval's Resting Place will be an obvious find. A Hollow stands by the entrance to a large chamber. Kill him before he sneaks up on you. The large chamber has a dry fountain in the middle due to a hole in the base. There is treasure and a very interesting looking skeleton in the fountain but you can't access this area yet. More importantly, upon entering, several Rats will sneak out of small holes around the room and attack. Individually they should pose no threat, however, groups can be dangerous and cause poisoning. Inside this chamber is a skeleton with a Large Soul of a Nameless Solider. Exiting via a small stair leads up to a hall area where you can immediately identify a Pharros' Lockstone face on the floor, which opens a bridge right next to it. This is about the only worthwhile Contraption, if you have no interest in joining the Rat Covenant. Activate it and cross the bridge to arrive at a large room with filled with petrified rats, and a small group of live ones crawl out. There is a corpse with 2x Poison Moss, a set of stairs up, and a skeleton with Whisper of Despair and a Torch. This ends with a door, blocked with a bridge like the one you just crossed that can be lowered with another Pharros' Lockstone on the floor above. However, we recommend against wasting a lockstone here, as you will be reaching the area across later. Heading back to the hall where you lowered the bridge, the right hand side (left hand from the stairs) ends with a Abandoned Hollow just hanging about, and a corpse with holding a whopping 3x Small Smooth & Silky Stone. Heading in the other direction, you will come to a Pharros' Lockstone face in the wall and a ladder. This one creates a waterfall that obscures vision and extinguishes torches and is intended to help Rat King Covenant members, as are the majority of Lockstones in this area. He is relatively fast but is not a tremendous threat on his own; allowing rats to join the fray does cause problems as they will fall and crawl to sneak up on you. You need to play offline for Rhoy the Explorer to invade you, otherwise you won't get invaded. After defeating Roy, you can inspect this new section, which mostly looks like the floor below but with several Pharros' Lockstone holes. The one in the floor right away lowers the bridge mentioned earlier -I wouldn't use it. Moving to the left leads to a tomb with a giant skeleton. A smaller skeleton in this area holds 3x Homeward Bone. Other lockstones will create acid pools that damage armor; these are more traps to help covenant members. Heading to the other direction leads to a the Grave Entrance bonfire and mist door, while the door leads to the boss fight. 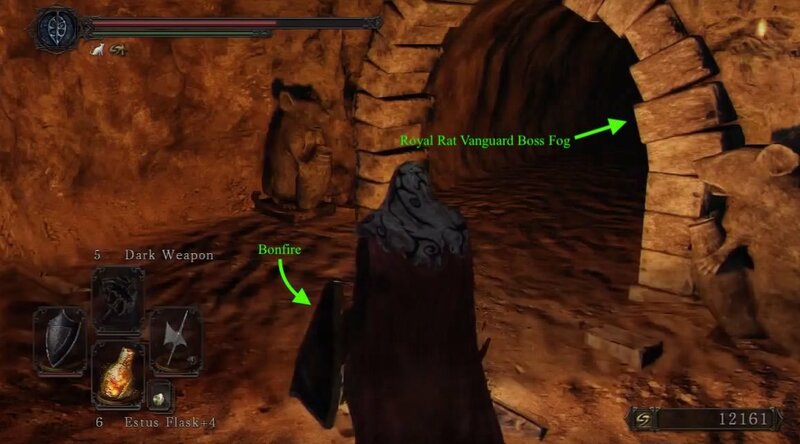 From the bonfire, there is also a direct passage to the boss fog. 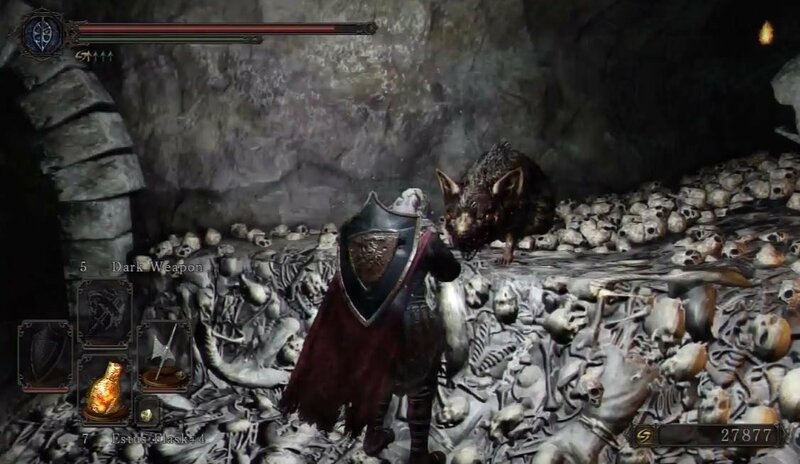 After defeating the boss the room leads to a door and The Rat King who will respect the murdering of his Vanguard and allows you to join the Rat King Covenant. You are given the ring Crest of the Rat. If you have entered the covenant the area rats and hollows will no longer attack you as you are now one of them. A hole in the floor after The Rat King drops down to the center fountain which was inaccessible before. Take a look at the very interesting skeleton before you do. There's nothing that happens but it's a nice touch. Below is a corpse with a Pharros' lockstone. The only way out is down which leads to a pit with coffins jutting out as ledges to jump down. This leads to a stone bridge above a broken wooden one. If you're quick enough, the broken wooden bridge holds a Crystal Lizard. Note that there's a separate access to The Gutter area from The Pit in Majula, and the Crystal Lizard is fairly easy to get from this entry. 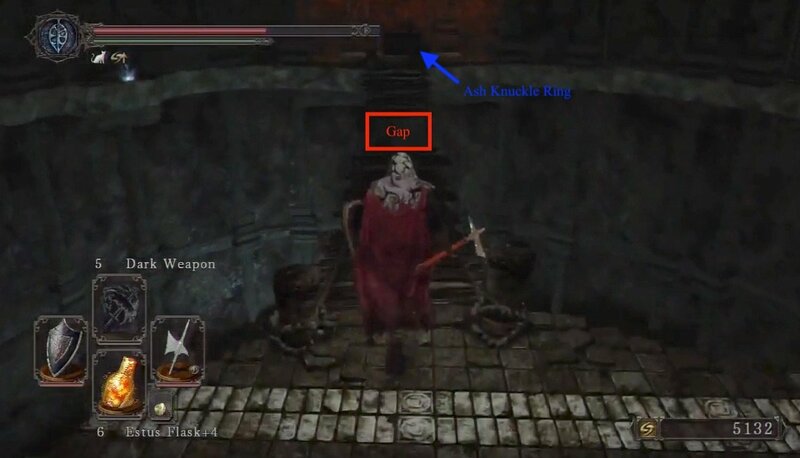 The skeleton on the bridge also holds a Bleed Stone. You can jump from the bridge to a small ledge with a corpse yields the Disc Chime. Alternately, drop down to the wooden bridge below. On one end of the wooden bridge past the gap is a chest containing Ash Knuckle Ring. Get a good running start and jump over. Note: The stairway on the other end of the bridge leads back to an entrance ledge in The Pit in Majula. Another Crystal Lizard will also spawn on the stairs just before the bridge. It will run across the bridge and fall through the hole, so make sure to kill it quickly. Jumping down from either the Disc Chime ledge or the wooden bridge, will land you in a water pit. Get out of water as it slows your movement and six exploding Rupturing Hollows are waiting in the two tunnels to the sides. Another thing to note is if you hang out on the wooden bridge for a while, before jumping down, Rupturing Hollows will come out for you to snipe. One tunnel has water and the other does not. The one with water contains a Skeleton with Great Heal. The other tunnel has a ladder and scaffolding further down. After the first drop...you're down there. You can't reach the ladder again. There are two choices down. When facing the ladder, a ladder to the left leads to another ladder and a corpse with a Human Effigy. The other direction leads to ladders down, passing a corpse with a Radiant Lifegem, near the bottom. Make sure to find this, as there is then another ladder with no way back up. A chest at the base holds a Token of Spite. A tunnel here leads out to The Gutter. Bring torches.